Fourteen Locks Canal & Heritage Centre Industrial HeritageLocated just outside Newport, on the road to Risca alongside the Monmouthshire and Brecon Canal is the Fourteen Locks Canal Visitor Centre. Visitors can trace the growth and decline of the Canal and its role in transporting commodities such as coal, iron, limestone and bricks from the South Wales valleys down to Newport docks. A computer based information point lets visitors experience a ‘virtual’ journey along the canal, learning how a canal lock works – even having a go at working a lock – all without leaving the Centre. The information point also has details of some of the people who used to work on the canal. Relatives of former canal workers are encouraged to contribute any information they may have to help add to the current knowledge of canal workers’ lives. 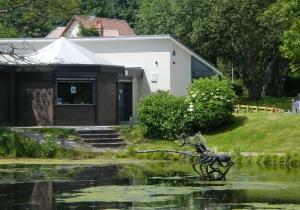 The Canal and Heritage Centre is now run by the volunteers of the Monmouthshire, Brecon and Abergavenny Canals Trust, and the Centre is now open 9:30 - 16:00, all year round. There is a tea room with outside patio, and a community meeting room with an IT suite. Family fun days and boat trips are organised from time to time, when the water supply is plentiful and the Santa’s Grotto at Christmas is very popular. Situated off junction 27 of the M4. Take the High Cross Road and after approximately half a mile turn right into Cefn Walk (sign posted Fourteen Locks) go over the canal bridge, the Centre and it’s car park are on your right.